BPH or Benign Prostate Hyperplasia. It is not a severe health problem, but often it asks for treatment. If the men are suffering from the critical symptoms or the condition is worsening,So do not delay and meet doctor before probleme become more serious. 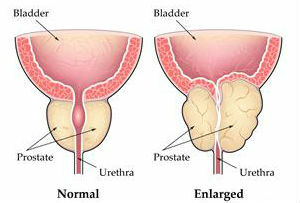 It is difficult to explain the exact factors that are responsible for the enlargement prostate. But, this problem is associated with the activity of the hormones. When a man gets older, the balance of hormones changes in his body that leads his prostate gland to be enlarged. Therefore, you are more likely to have BPH as you get older and especially if you are above 50 years. Such symptoms can cause other hazardous condition. If your bladder does not get empty entirely, it can make you face the inability to urinate, incontinence, blood in urine, bladder stones or your kidney can be damaged. Thus, in such a case, the very first thing you have to do is to consult the doctor as soon as possible and roots out this miserable condition. Most of the time, surgery is recommended to those have such a troublesome. But besides the medical care, you can try to treat BPH symptoms at home. These are some tips that can help you to desolate the discomfort of BPH. It prevents the risk of the condition to be more dangerous. Further, its valuable benefits cure you enlarged prostate at home. Diet plays a significant role in while having enlarged prostate. Hence, it is the must to cure such problems. You have to consume foods that can treat your BPH symptoms efficaciously. Moreover, a balance and right diet hands in your healthy prostate. Most of the foods category makes you to pee frequently. You should avoid such foods that affect your prostate health.